Notre-Dame Cathedral on the Ile de la Cité in Paris, a masterpiece of the gothic art listed on the UNESCO World Heritage. Climn the 387 steps to the top of several spiral staircases and discover the panoramic views over the roof of Paris. The construction began in 1163, during the reign of Louis VII, construction of the choir took from 1163 until around 1177 and the new High Altar was consecrated in 1182. By this stage, the western facade had also been laid out, though it was not completed until around the mid 1240s. Between 1210 and 1220, the fourth architect oversaw the construction of the level with the rose window and the great halls beneath the towers. Around 1345 the Cathedral was finally completed. Starting in 1991, a 10 year program of general maintenance and restoration was initiated. 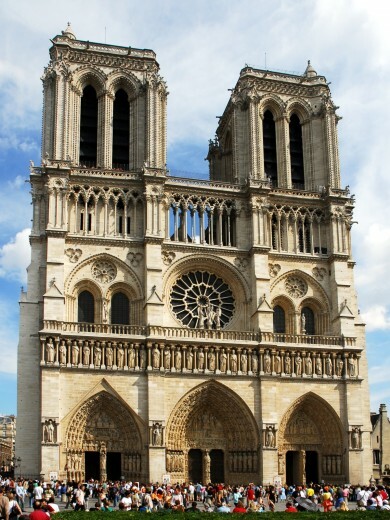 Notre Dame Cathedral is walking distance from the hotel Louvre Marsollier in less than 20 minutes.